It is full of vitamin A C B E B1,B2,B6,B12,calcium,iron,niacin,folic acid, Pantothenic acid, phosphorus, magnesium, zinc, copper & other Mineral like chromium, manganese, Molybdenum, Sodium, potassium in a rich quantity. 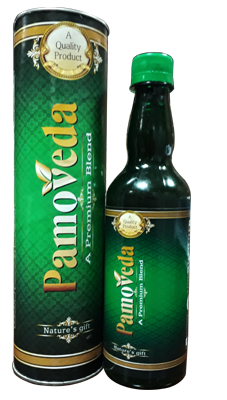 Pamoveda is basically a mixture of various ayurvedic berries pure extract. There are no contents of chemicals, pesticides, heavy metals, fertilizer. It is prepared very carefully & hygienically. Pamoveda is one of its own kind formulations & with regular uses this product can really make difference in his/ her health. 1. Pamoveda, provides complete essential nutritients with required quantity to our body. 2. Pamoveda helps for the digestion. 3. Pamoveda generates useful calories to the body. 4. Pamoveda boost the immune system. 5. Pamoveda helps for the excellent blood circulation in body. 6. Pamoveda removes toxins from the body. 7. Pamoveda helps to relieve the stress. 8. Pamoveda develops very good hormonal balance. 9. Pamoveda helps cells to work properly. 10. Pamoveda more importantly helps to heal wounds and also relieves the pains. 11. Pamoveda helps to reduce hair falls and significantly helps to glow body skin. 1. Pamoveda helps to decrease’s acidity and acid refluxes. 2. Pamoveda removes toxins from the and keep blood pure. 3. Pamoveda helps to boost the immune and moreover maintains the monthly menses in females. 4. Pamoveda improves breathing system. 5. Pamoveda helps quiet significantly to the Arthritis patients. 6. Pamoveda improves the performance & keeps kidney’s in good state. 7. Pamoveda boost the liver and Gall Bladder functions. 8. Pamoveda brings happiness throughout day. booster, Anti-oxidant, Anti-inflammatory, Anti Aging, cellular Rejuvenator & Immunomodulator. It has high ORAC value & Strong antioxidant network. It fights cells damaging free radicals, Supports Healthy Cell Reproduction, Improves function of Heart, liver, lungs, Brain and Skeleton System. It Nourishes Skin and complexion. It is good for Anti-Acne treatment. It help in Scars, burns and Wound repair. It increases RBC and WBC, etc. Amla is a strong rejuvenator and anti-oxidant. It prevents premature ageing, balances stomach acids, improves food absorption, enhances brain functions, treats respiratory disorders, detoxifies and cleanses the body. It is a Fertility enhancer, strengthens immune system, coolant, and treats hemorrhage, diarrhea and dysentery. Due to strong vitamin C content it is very useful for scurvy, treating skin disorders, disorders of the eye, premature graying and fallings of hair,etc. Aloe vera is beneficial for Healing wounds, Soothing Burns, Strengthening Immune Function, and Countering constipation. The Aloe plant contains Anti-Viral, Anti-Fungal and Anti-Bacterial agents that help the body to protect itself against infections. It helps in physical fitness, stress, hypertension and arthritic pain It is anti-inflammatory and strong rejuvenator. It helps to get sound sleep, lower high cholesterol levels, enhances brain and nervous system functions, etc. Noni is fruit from a sacred tree Morinda citrifolia grows as big as 20 feet with large evergreen leaves and small white flowers, which develop into a small bumpy fruit. The fruit is called bu different names like hog apple, cheese fruit, lade, pain killer tree and Indian Mulberry. Dragon fruit have a surprising number of phytonutrients. Rich in anti-oxidant they contain vit C, Good fatty acid, several B vit for carbohydrates metabolism as well as carotene and protein. Acai berry contain anti-oxidant fiber and heart-healthy fat. They may have more anti-oxidant than other commonly eaten berries. Blue berry's fiber potassium, to late, vit. C, Vit. B 6 & phytonutrients content, coupled with is lack of cholesterol, all support heart health. Kiwi fruit is an excellent source of vit. C & Vit K as well as a very good source of lopper & Dietary fiber. It is also good source of vit. E, potassium, folate & manganese This super fruit is host to numerous nutrition benefits. In Addition to its whole food form kiwi can also be found as a supplements. Gosi berry are loaded with beta-carotene (a. pigment found in plants and fruit) which helps to promote healthy skin. Gosi berry have also been known to help boost in immune system and protect the eye Gosi berry are rich in nutrient It's also helps in quality of sleep & weight loss. It is loaded with Anti-oxidant & nutrient that have powerful effect on the body. This improved brains function, fat loss, & lower risk of cancer & much other incred benefit. Please do not drink Pamoveda in pregnancy. Dosage: Drink on an empty stomach 30min before food diluted add 20ml of PAMOVEDA 200ml of lukewarm water.